Specialists trained to advise you on the best treatment options. Skin cancers such as basal cell carcinomas, are the most common cancers in Australia. A biopsy is used to determine the type (and sub-type) of skin cancer that you have. Our dermatologists are specially trained to advise you on the best treatment options for your skin cancer. When choosing a treatment modality, you will be given advise on the best clinical response, down time expected, side effects, advantages, disadvantages and costs of treatment. There are many different types of skin cancers which include Basal Cell Carcinomas (BCC), Squamous Cell Carcinoma (SCC) and Melanomas. While some skin cancers can be easily diagnosed during a thorough clinical examination, a biopsy maybe undertaken to determine the type (and sub-type) of skin cancer that you have. With this information, a dermatologist is specially trained to advise you on the best treatment options for skin cancer management. When choosing a treatment modality, you will be given advise on the best clinical treatments and take into consideration the amount of down time, social circumstances and other medical problems which you may have. There are many different surgical, non surgical, laser and light therapies to treat skin cancers. Dermatological expertise is required in choosing the correct treatment for the appropriate skin cancer. On-going specialist or nursing support may be indicated for some treatment courses. Our nurses are experienced in patient education and are always available for clinical support for our patients. Melanoma is a serious skin cancer. Our dermatologists are experts in diagnosing and managing this disease. We strongly believe in the importance of regular surveillance for high risk individuals to prevent this disease from occurring. We remain committed to being up to date with the latest clinical trials and research in this disease for the benefit of our patients. This is an excellent non-surgical treatment option for patients which have certain skin cancers in cosmetically sensitive areas or those which would like to avoid surgery. This is also an excellent treatment for patients who have widespread sun damage and wish to be proactive with their skin and prevent skin cancers from forming in the future. Squamous Cell Carcinoma (SCC) is serious form of skin cancer which has the ability to metastasise (spread) through the body. Dermatological expertise is critical in the treatment and future surveillance of this disease. Regular skin checks and follow up are crucial after being diagnosed with this disease. In the early stages of this disease, SCC-in situ (or Bowen’s Disease), non surgical treatments may be applicable. Basal Cell Carcinoma (BCC) are the most commonly diagnosed cancer in Australia. 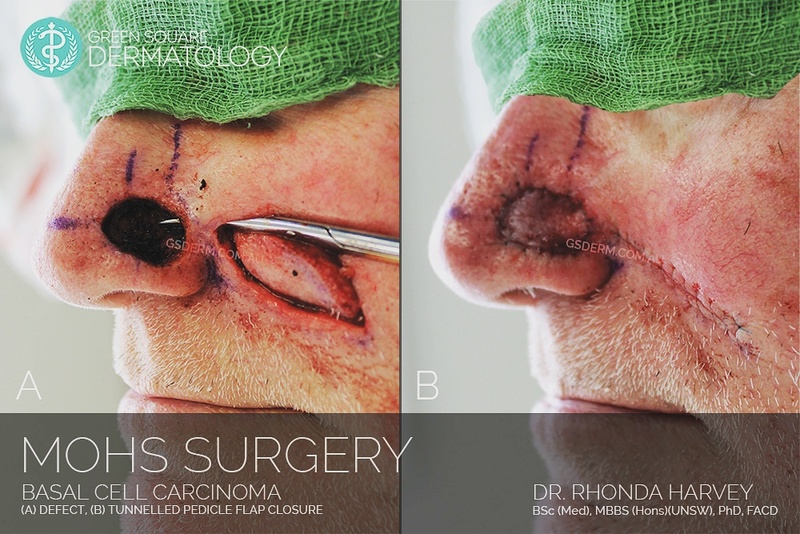 While most of the BCCs can be easily treated, there are certain BCC sub-types which require specialist intervention and Mohs surgery. BCCs must not be treated trivially; dermatologists understand the biology of this disease and can appropriately instigate treatments which may range from simple topical therapies to expert Mohs surgery or radiotherapy. Today, Mohs surgery has come to be accepted as the single most effective technique for removing Basal Cell Carcinoma and Squamous Cell Carcinoma (BCCs and SCCs), the two most common skin cancers. With Mohs surgery, the greatest amount of healthy tissue is spared while expunging cancer cells; cure rates for BCC and SCC are an unparalleled 97 percent or higher with Mohs, significantly better than the rates for standard excision or any other accepted method.